In this month’s issue of Wood News, Amy Herschleb writes about her own journey learning how to cut a dovetail by hand. 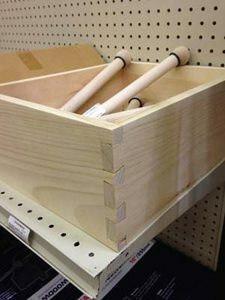 Amy is a staff writer for Highland and a relative beginner to woodworking, but her current surroundings working at the Highland Woodworking retail store make for a perfect environment to immerse herself in all things woodworking and learn various ways of approaching the basics. Amy will be providing a beginner’s take on a number of different woodworking topics, including joinery, sharpening, hand planes, carving and much more. Keep your eye out here for more articles to come! In the meantime, you can read about Amy’s entertaining exploration into different ways of cutting a dovetail.